Tamerlane's campaign was a success. After five days, six bus transfers, and over 3,100 miles, I reached the Arctic. In retrospect, the true heroes of this journey are the tough, reliable, American buses and vans that I rode in. The MCI 102C3 is the oldest passenger bus in the current Greyhound Canada fleet. The clutch on the bus I was riding in from Dawson Creek to Whitehorse was about to go kaput. Nevertheless, the bus made it through some gnarly passes, sub-freezing weather, and icy roads with barely a hiccup. Okay, maybe a few. In northern British Columbia and the Yukon, Greyhound also acts as a courier, taking the role of DHL/UPS/FedEx/postal service/bike messenger. The bus I rode in towed this trailer-full of packages. For the Whitehorse to Fairbanks leg, this rear wheel drive Chevy Express 3500 van was comfortable and quick. 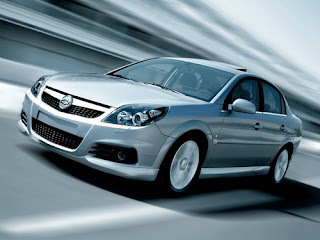 It has a 6 liter Vortec engine and stability control. With snow tires and at the hands of an experienced driver, this van can take you anywhere. This was by far the best vehicle out of the three in this post. This Ford E350 took me from Fairbanks to the Arctic Circle. It is bone stock except for the Hella driving lights, sat phone, and snow tires. The 5.4 liter V8 produces 350 pound-feet of torque, which is enough to tow Tamerlane's battering ram and trebuchet. My only complaint: the second row passenger side seatbelt was overly complicated and required one buckle to act as a "key" to unlock the second buckle. 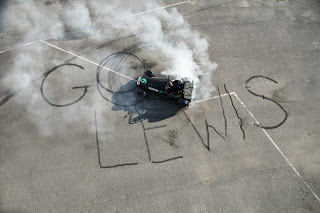 I'm rooting for Lewis H. this weekend, but my prediction is that Alonso wins his third championship at Interlagos. P.S. Tamerlane will be on a campaign next week to conquer the Arctic. He shall return, hopefully victorious, in a week or so. Bam! 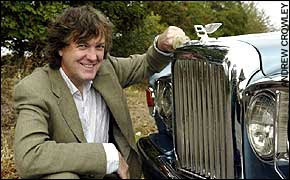 That was my reaction when I happened upon James May's column in The Daily Telegraph this evening. He's giving away his beloved T2 in a contest. Before today, I had never heard of a T2. To most, this car looks like your typical RR Silver Shadow. 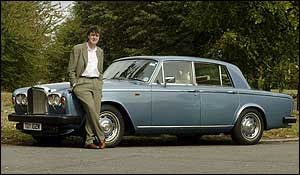 I've always taken a special liking to the Silver Shadow. I had two experiences with that model as a child. First, I saw Jamie Farr drive one across America in Cannonball Run. My second experience involved seeing it parked at a local Chinese restaurant. Apparently, the owner lived up the hill from us and was known to tip generously at Yen's-- a whopping $10! Though I liked the RR's looks and style, I thought it overly ostentatious. But this T2 is a whole different animal. 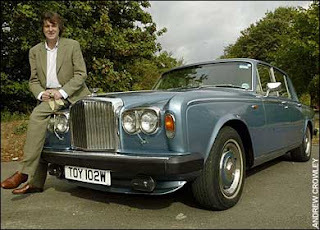 It is essentially a Silver Shadow, only with a smaller grill and the winged "B" instead of the Spirit of Ecstasy. But those two small changes made a huge difference in my eyes, mind, and heart. That is one sweet ride. Too bad the contest is only open to residents of Great Britain, the Channel Islands, the Isle of Man, and the Republic of Ireland. It's amazing how, after checking out hundreds of potential state cars, I can differentiate between the Merc, BMW, and Audi by just looking at a small portion of black sheetmetal. My search now widens to include tourist photos. It's getting really difficult, but I persevere for you, my loyal readers. 114. Venezuela. Despite Hugo's anti-Yanqui attitude, his official ride for his January inauguration is a classic 80s Cadillac Fleetwood. So much for the Bolivarian Revolution. 115. Bosnia and Herzegovina. Here we see two of the three co-presidents in front of their official car, an Audi. 116. Montenegro. 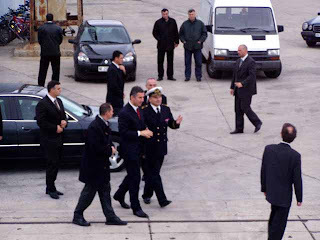 And since we are talking about the former Yugoslavia, here is the PM with his stretched A8. 117. Panama. 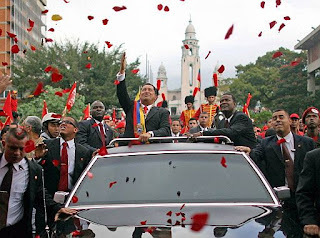 The first of the vacation shots shows the Panamanian prez in his Land Cruiser. 118. Poland. 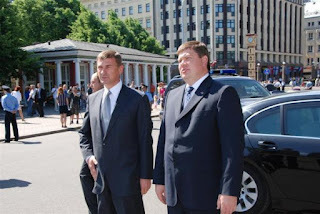 The second vacation photo shows the Polish P.M.'s 7 series. 119. Senegal. Here is President Wade with his very American Ford Expedition. All I can say is: slim pickin's. The countries are getting more obscure. Their official websites have no bandwidth, have expired, or do not exist at all. Nevertheless, I continue to find and identify cars at a rate of about two per search session. 108. Cape Verde. 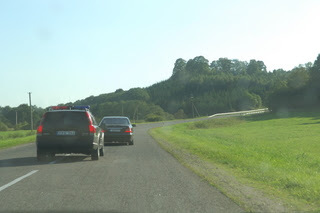 The PM rides around in a Mitsu Montero Sport, the poorman's Land Cruiser. At least it's a step up (albeit very small) from Uruguay's Mitsu Galant. As GDPs fall, so do the retail values of the state cars. 109. Eritrea. The president zips around the capital in an anonymous white BMW. I think this is the first white BMW we've encountered on this list. 110. The Gambia. From the President's official website is this picture of him exiting his Hummer H2. It seems we Yanks don't have a monopoly on poor taste. 111. Latvia. 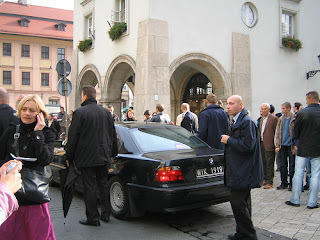 7-series B.M. for the P.M.
112, 113. Lithuania, Turkmenistan. 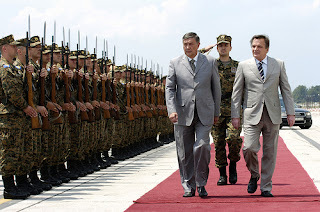 The Baltic P.M. rides in a Merc S-class, as does the head of Turkmenistan. 101. 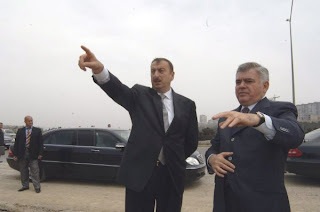 Azerbaijan. After examining dozens of pictures of the president and his overly Botoxed first lady, I found this picture of his Merc limousine. 102, 103. Cameroon, Madagascar. 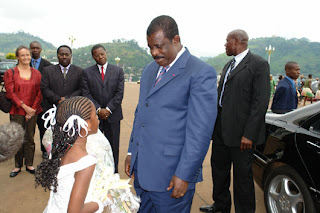 Here is a picture of strongman Paul Biya talking to one of his young subjects in front of his black Merc W220. 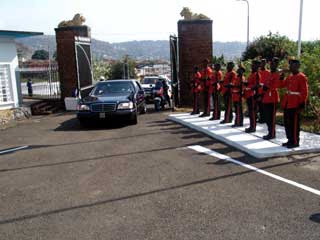 Madagascar's president has the same car. 104. Uruguay. In keeping with South America's unique penchant for unconventional state rides, El Presidente rides in a Chevy/Holden/Opel Vectra. At least it's a step up from his last ride, a Mitsubishi Galant. Yak! 105. Sierra Leone. 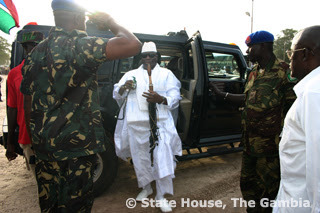 In honor of the outgoing, and honest, president of Sierra Leone (Kabbah), I give you this shot of him arriving in his...(drumroll please)...black Merc. 106. Palestine. This is not an official state recognized by the U.N. yet, but that did not stop me from listing Taiwan and the Vatican in this list previously. 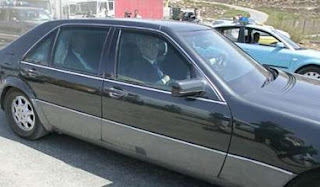 Abbas rides in this obviously armored Merc. 107. Israel. Since the country's founding, the PM and the ministry heads have been driven in Volvos. When someone recently proposed that the cars be replaced with German (gasp) Audis, that someone was immediately flogged and voted off the island. During Concours week a couple of months ago in Monterey, I was stopped at a red light. In front of me, at first glance, was a pedestrian Mercedes W124 with two well-to-do country club boomer types in it. I looked at its rear license plate frame, which strangely just read "Porsche Mercedes". Strange. Then I looked at the trunk lid badge-- 500E. I remember reading about this Teutonic oddity in a Car & Driver when I was in high school. Never, in all those years (15) had I seen one in person. In the early 90s, Porsche was not doing too hot. Its lineup included the perennial 911 and the aging 928 and 944. With the 959 discontinued, part of Porsche's Rossle-Bau plant in Zuffenhausen was idle. 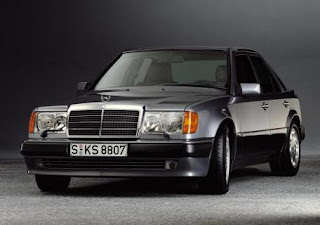 Mercedes, which at that time was aggressively churning out a new model every year, was overextended and did not have the capacity, nor the time, to turn its W124 sedan into an uber-sedan to compete with the E34 M5. Mercedes turned to Porsche. The sports car maker shoehorned the 5 liter engine from the 500SL under the W124's bonnet. An extra 22 pound feet of torque was extracted. The engine bay was widened and reinforced. The engine was moved as far back as possible to optimize balance. Heavy duty suspension bits and other performance upgrades, along with wider fender flares, completed the transformation. The 500E was hand built and each car took 18 days to complete, during which it was transported back and forth between the Mercedes and Porsche factories. The final result: 322 horsepower, 354 pound feet of torque, zero to 100 km/h in 5.5 seconds. Only 1,505 units ended up in the States. With Porsche's personal touch, this was the last great uber-Benz. Since then, everyone and their accountant's wives have been driving uninspired, bland, commodified, and superficially appealing AMGs with stupid torque and useless horsepower. Too bad, that. 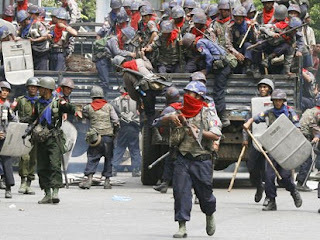 As quickly as the pro-democracy movement blossomed and gained worldwide support and attention, the military junta just as quickly snuffed it out. 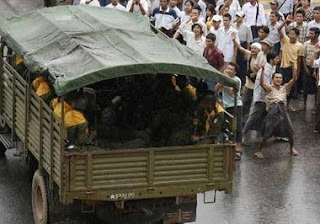 The military needed to transport its troops quickly and en masse to population centers such as Yangon and Mandalay, where tens of thousands of monks and their supporters protested. That meant, of course, lots and lots of reliable and available troop transport vehicles. 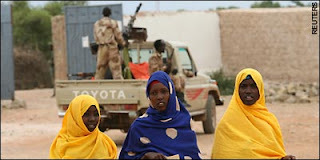 Almost every image of troops in cities had the trucks they rode into town in in the background. Here's one. 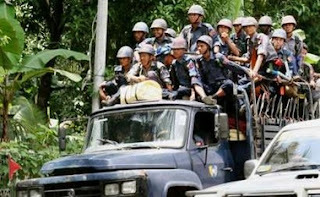 ...transporting uniformed thugs and killers. 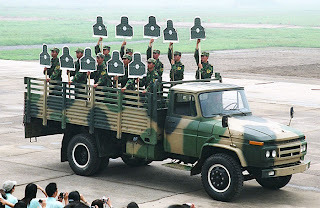 In 1997, the Chinese sold 1,000 Dongfeng EQ2102 3 1/2 ton 6x6s pictured above to the Burmese military. The military was so pleased with them, it bought another 3,000 units from Red China in 2002. 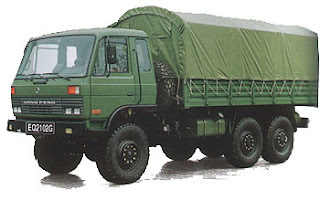 Myanmar bought 4,000 of the above Dongfeng EQ1093 in 1992. 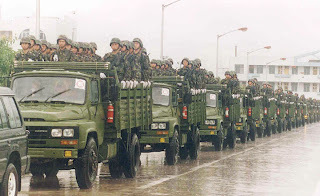 And it all started when the military bought 4,000 of these Dongfeng EQ1091 5 ton 4x2s in the mid-1990s when the domestically assembled Hinos proved too unreliable. I wonder whose side the PEOPLES' Republic of China is on? 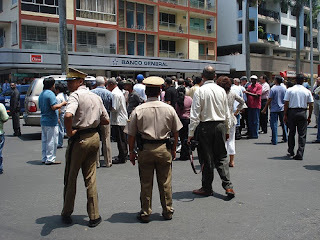 The junta or the people? 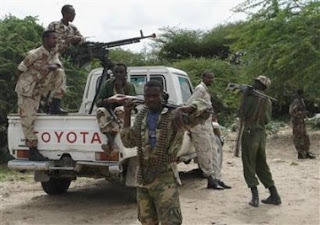 Just as Toyota's reliable, affordable, and accessible Corolla has brought prosperity and stability to the people of Afghanistan, the equally reliable, affordable, and accessible Land Cruiser has brought misery and terror to the peoples of Somalia and Darfur. 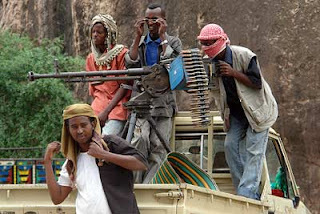 News footage of the war torn regions inevitably shows young thugs and militiamen riding in Toyota Land Cruisers, often with the cab's roof hastily chopped off and with an obligatory machine gun mounted in the bed. These vehicles are called "technicals". 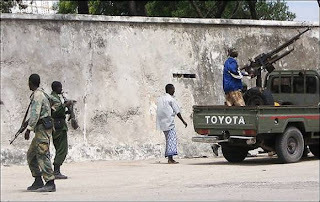 The term for the vehicle originated in Mogadishu, Somalia. Red Cross officials had to pay local strongmen bribes for protection. These strongmen usually had fleets of armed Land Cruisers. The Red Cross wrote off these bribes as "technical expenses." Technicals proved to be effective in urban and desert warfare. The high clearance vehicles cleared sand dunes as easily as potholes. 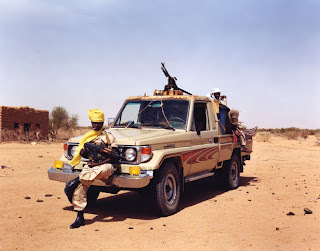 In the Toyota War, a 1987 conflict which pitted a conventional mechanized Libyan army with a ragtag group of Chadian guerillas riding in Toyotas, the Chadians destroyed one tenth of the Libyan army. 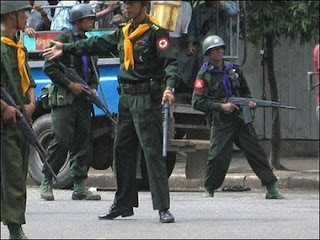 The technicals are even more fearsome when their guns are aimed at unarmed civilians. Whether a technical is driving by at 100 km/hr shooting indiscriminately or at a complete stop with its gun shooting at a precise target, the technical is the ultimate weapon of terror. The mere sight or sound of a technical brings back horrifying flashbacks throughout refugee camps in Africa's Horn. Because these hardy Toyotas can withstand grueling conditions with little to no maintenance, they will keep running for years, if not decades. 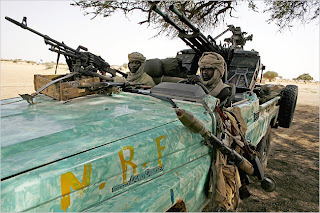 Too bad the Janjaweed and Somali warlords didn't pick something less reliable and more temperamental, like a Land Rover or a UAZ. Alas, the unintentional consequence of building a solid, reliable vehicle.